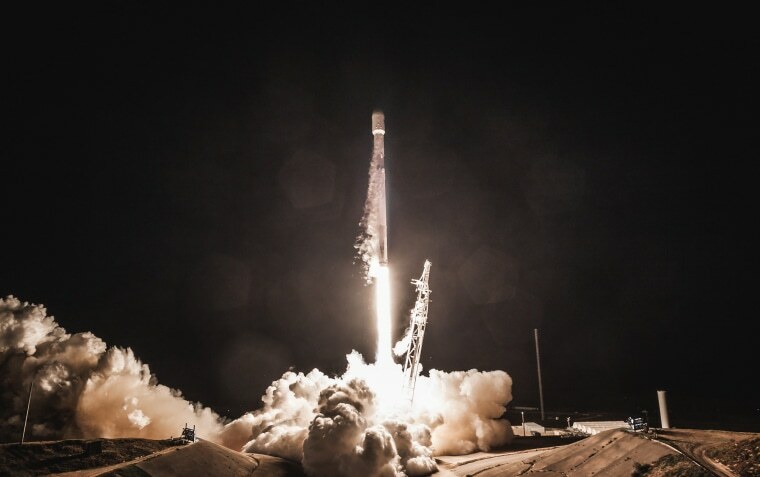 A pair of test satellites launched into orbit by SpaceX on Feb. 22 may herald the dawn of a truly global internet, one that makes high-speed service available not only in cities and in rural areas covered by cellphone towers but at almost any point on the planet. Dubbed Tintin A and Tintin B, the satellites are prototypes for SpaceX’s “Starlink” initiative, which aims to place thousands of satellites in low-Earth orbit to supply broadband internet to users on the ground — including people in remote areas and even aircraft in flight and ships at sea. “Don’t tell anyone, but the wifi password is ‘martians’,” SpaceX founder Elon Musk joked in a tweet as the satellites made their first orbits. In reality, WiFi gear can’t tune in to the high-frequency transmissions the satellites beam down; for now only a few SpaceX ground stations can communicate with them. But SpaceX sees a day when space-based internet services will cost about the same, and work at least as well as, similar services offered via telephone line or cable. So instead of buying an internet plan from a cellular network or a cable or phone company, you might buy a plan from SpaceX. SpaceX hasn’t said when its network could be ready. If Tintin A and Tintin B work as planned, the company could start launching a first wave of more than 4,000 Starlink satellites in 2019. It would likely take several years to launch the first 800 satellites that the company says are needed to make the network operational. Satellite internet services and satellite telephones already exist, of course. But they typically use satellites in geostationary orbit high above Earth’s equator. Geostationary satellites are costly to build and to place in orbit, and that makes them costly to use. The network envisioned by SpaceX will use cheaper satellites in low, fast-moving orbits. Each satellite will be able to “see” only a small part of the Earth’s surface at a time, but they will be able to relay data via other satellites in the network. SpaceX isn’t alone in the internet’s race into space. A satellite venture being developed by Arlington, Virginia-based OneWeb plans to offer broadband service from a network of satellites in low-Earth orbit, starting with access to remote parts of Alaska in 2019. A San Francisco startup, Astranis Space Technologies, is taking a more limited approach, beginning with a single internet-connected satellite in geostationary orbit. And Boeing, Facebook, and the satellite companies Viasat and Telesat all plan to extend the internet into space. Meanwhile, Alphabet — the company that owns Google and its experimental subsidiary X — has developed experimental high-altitude balloons that can relay internet connections over a wide area. “Project Loon” balloons are being used now in Puerto Rico to provide internet access in areas that are still reeling six months after Hurricane Maria devastated much of the island. What do internet evangelists make of all the activity? “We are always excited to see new initiatives and innovations that aim to tackle our common goal of enabling universal, affordable internet access — and particularly those that aim to connect those in rural or other underserved communities," says Sonia Jorge, executive director of the Alliance for Affordable Internet, a group directed by the World Wide Web Foundation. But Jorge says the high cost of internet connections, even when advanced technology makes those connections possible, remains an obstacle to providing internet access for everyone on the planet. In parts of Africa, for example, 1 gigabyte of internet data can cost as much as 10 percent of the average annual salary, according to Jorge.